Ugggh…the class I like the least. I actually love the idea of the class and is usually the class I choose in RPGs. My displeasure actually comes from not be able to play them very well and me and Lance go back ….way back and I’m not over it yet. Originally I was going to release Rogues last but in honor of one of our authors bobross who love this class, I’ve fast tracked them to head of the class. •Lance Shadowstalker – 4SE: Target friendly ally has ambush, stealth and haste until the start of your next turn. •Serena Thoughtripper – 3SE: Until the end of your turn, your weapons have +2 attack, and if Serena deals combat damage to a hero, that hero’s owner discards a card at random. •Garth Ravensoul – 3SE: Target opposing ally takes 1 damage and all other damage to that ally is doubled until the start of your next turn. 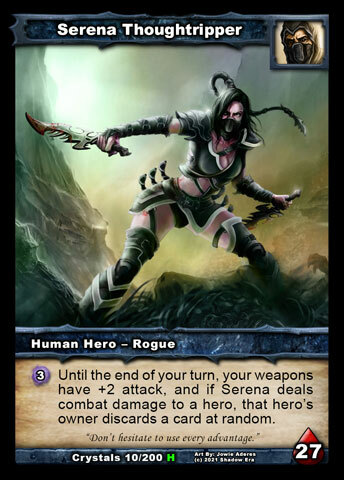 Serena Thoughtripper – 3SE: Until the end of your turn, your weapons have +2 attack, and if Serena deals combat damage to a hero, that hero’s owner discards a card at random. Serena excels at control, and has since the beginning. She represents a difficult, hybrid play-style, combining items and allies. Like other rogues, she does best when she has some board presence; however she sometimes has difficulty regaining board presence or control once she’s lost it. She has comparably little room for error and it is often important to anticipate your opponent’s moves. For this reason, Serena is often considered difficult to play, like Logan. Unlike Logan, she has been considered a middle-tier hero (not the strongest, but not the weakest), and may even be top-tier in the current version (2.86-2.87). Serena requires a weapon to use her ability, which means that Serena decks would do well to have at least 6 weapons in a 40 card deck. Having many items and abilities makes Serena have less room for allies, and so it is important to make those allies count. When Serena is played well with a good deck, it feels like everything is under control: even when the opponent doesn’t know it, she has an answer for everything.